Penetrating oil also referred to as penetrating liquid is a low-viscosity, petroleum-based lubricant. The best penetrating oil does usually have low viscosity. Therefore, it flows effortlessly when applied on affected parts. Penetrating oils got their name from their capability to penetrate/enter in the narrowest spaces in the middle of the threads of two parts. These oils usually displace other materials and leave a thin coating of oil in the surface pores of a given object. Though they can be used for general lubricating purposes. This is not entirely wise due to the oils’ volatile nature. Normally, they vaporize in a very short period of time. Thus, they leave behind very little lubrication remains. Generally, penetrating oils are made of a mixture of methyl silicone, zine dialkyl thiophsphate, polymethacryalate, tert-dibutyl-p-cresol, alkyl succinic acid, lower alkyl benzenes, and lower alkanols in a stock of kerosene bright lube oil. The alkanols elements are normally included as lower alcohol variations, such as propanol or methanol. Tax and economy purposes call for a mixture of methanol and isopropanol in a ratio of 1 to 5. Bright oil base is normally developed from a mixture of natural paraffin oils that are typically pre-treated for high viscosity and low viscosity lubricants. Antioxidants and reducing agents are those regularly added to oils for motors and may vary in quantity when used in penetrating oils. This kind of penetrating oils have solid lubricant particles that exist in a synthetic or natural oil base and are fire resistant. The particles of the oil can be of any variety of solid lubricant. The best examples include polytetrafluoroethylene, graphite, and boron nitride. Straight penetrating oils are the ones frequently used for mechanical applications. These are non- emulsify oils made from base mineral lubricants with esters, fats or extreme pressure additives, including phosphorous, sulfur, and chlorine. 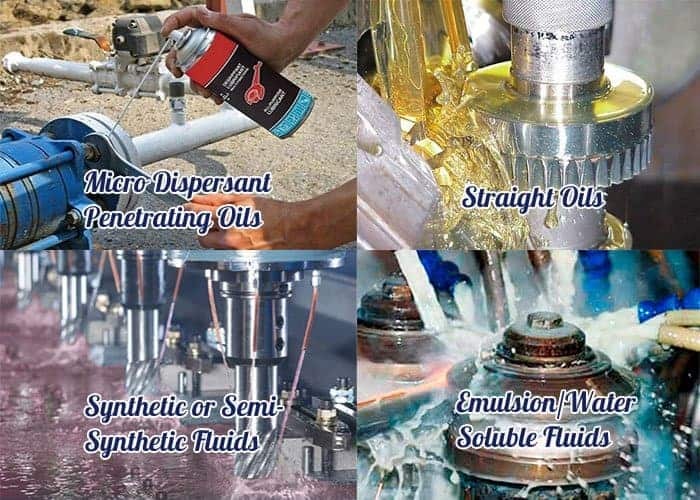 Semi-synthetic and synthetic penetrating oils and penetrants are composed of synthetic compounds, such as: blends of synthetic fluids and water; chlorofluorocarbons, di-esters, esters, poly-glycol, and silicone. Emulsion and water soluble liquids have a very low concentration or a high dilution and consist of high water content fluids. These penetrating oils and penetrants are usually used in a diluted version with concentration percentage of up to 10 percent. The low viscosity nature of penetrating oils allow them to lubricate parts without resistance. It is typically easier to apply as well as reapply the best penetrating oil with aerosol spray, especially too hard to reach places. Low viscosity oil seeps deep into the narrowest places when you apply to stuck threads. This helps to loosen encrusted deposit and free the pieces. A good penetrant will help to easily loosen tightly fit moving parts, especially ones that make noise. The top penetrating oil for rusted bolts are effective at protecting aluminum and iron from rust. This is so since the oil has a trend of expanding across the applied surfaces in a uniform coat and it’s capable of repelling water molecules. Penetrating oils are made up of hydrocarbons with up to 20% in liquefied carbon dioxide and an exception of 10% to 15% in inert materials. One of the outstanding nonpolar solvents, which is normally liquid under normal conditions is hexane. Water, which is a polar solvent, is typically effective at breaking up and dissolving specific substances, including metal ions, sugars, and salts. However, water is useless at dissolving non-polar solvents (plastics, fats, or oils). Permanent marker, stickers, chewing gum, and among other troubles that cannot simply be broken down by water. The Kano Kroil is the best penetrating oil for rusted bolts. It penetrates and loosens frozen metal parts in minutes. It quickly loosens rusted bolts and nuts. Kroil penetrates to 1 millionth inch spaces, dissolving and preventing rust without attacking the metal. The oil displaces water, dissolved gum, dried grease and provides lubrication. Kroil has a unique chemical structure that was engineered chemically in a laboratory. This defines the interdisciplinary electrical, physical, chemical mechanical properties that work well with joint metal parts. The scientific principle behind Kriol’s working is that it reduces surface tension and creeps in. The oil has a unique molecular architecture creating an affinity to the metal. This product loosens every frozen inch of the metal. Kano Kroil Penetrating oil is pretty expensive to acquire. To save on money if needed every now and then, do not pour so much of it to avoid spilling and make sure it stays in its can. What Are The Uses Of Kano Kroil Penetrating Oil? You can use the oil on mowers, tractors, autos and gun. It can easily loosen a bolt or a stripped screw stuck together with rust. It is the best thing when it comes to dealing with firearms. It also works on brass and aluminum threads and can resolve frozen fittings of objects such as cameras. How is Kano Kroil Penetrating Oil Used? Using Kano Kroil is a simple task. You will need cotton ball to make rusting easier. Put the ball on the mouth of the bottle and fill it with Kroil. Put the ball at any place you want rusting to be prevented. I find just two drops of the oil sufficient to deal with metal rust. To sneak penetrating oil into tiny or confined spaces, you need a narrow mouthed bottle with droppers or spouts. Pouring into the holes increase risk of spilling. Suppose any given object is loaded corrosion and is frozen or seized, Kano Kroil penetrating oil will deal with it. This penetrating oil is far better than the other varieties in the market. Every household should have this amazing stuff to get rid of corrosion or rust any time. The PB Blaster busts loose frozen or rusted parts caused by corrosion and rust in minutes. It contains a non-evaporating lubricant, which saves time and also protects against further corrosion and rust. The spray works on rusted nuts and bolts. Spray PB on the required part and let it sit for a while. This concentrated penetrant creeps up, spreads and surrounds into hard-to-reach spaces, allowing parts to escape surface tension of corrosion and rust. The spray offers hardworking, top-quality formula which leaves behind a lubricating film to prevent further rusting. The penetrating catalyst can be sprayed as a mist. It is so fine that it will find even the smallest openings in between metal parts penetrating them within a short time. It seeps into almost invisible crevices loosening metal connection that appeared rusted solid over time. Lots of fumes when the product is used. Consider using it in open space or leave any openings wide open to ensure air circulation. How Should Blaster 16-PB Penetrating Catalyst Be Used? After spraying PB Blaster on fused parts, give it several hours or even the entire night to sit for the penetrating oil to seep in. You can then use your wrenches to loosen the parts a little bit. If they will not budge, try a second heavy dose of the oil and let it sit for a while. I consider using heat on very stubborn parts to make them loose. For instance, a stuck nut warmed using a heat gun will automatically expand enough to enable your wrench to turn it. Remember not to apply direct flame to parts still wet with oil as the oil will evaporate rather quickly. There is also a possibility of igniting the oil as it is petroleum-based. What Are The Uses Of Blaster 16 PB-Penetrating Oil? PB Blaster can be used on automotive, plumbing, marine, industrial and other equipment. You may need to apply it 1-3 times depending on stuckness of the stripped bolt or rusted nut. I find it best to apply 6-12 hours apart from each application to effectively soak in at molecular level. The penetrating catalyst is useful, especially when you have rusted or corroded nuts or bolts that will not budge. It does a good job on any rusted projects. The spraying can may run out of pressure before the can is emptied. About half of the product is wasted. Therefore, use it well on required parts to save on money. BEST SELLER - The #1-selling penetrant since 1957! The PB B'laster outperforms leading competitors with its high-performance formula. EFFECTIVE - PB B'laster quickly busts loose rusted or frozen parts caused by rust and corrosion. Attack rust from all angles using the unique capillary action. SAVE TIME - This fast acting penetrant also contains a non-evaporating lubricant that saves time and equipment. It makes rusted nuts and frozen bolts a struggle-free job. Don't worry about the future, PB B'laster also protects against further rust and corrosion. MULTIPLE USES - Rust can build up in many places. Use the the PB B'laster on car parts, fishing reels and tackle, all tools, firearms, sports equipment, marine applications and more. The WD-4O is a multi-use product that penetrates stuck places, protects metal from corrosion and rust, displaces moisture and lubricates anything. It is a water-based aerosol with a unique bio-solvent proven to be more powerful and easy to use degreaser in the market. It breaks quickly through tough grime and grease and it is the best when it comes to cleaning tools, shop floors, greasy automotive parts, commercial appliances and many more. The added corrosion inhibitors present in the product help in protecting against flash rust. While the WD stands for water displacement, the product is a rare special blend of lubricants. The formulation of the product contains anti-corrosion agents and components for penetration, soil removal and water displacement. 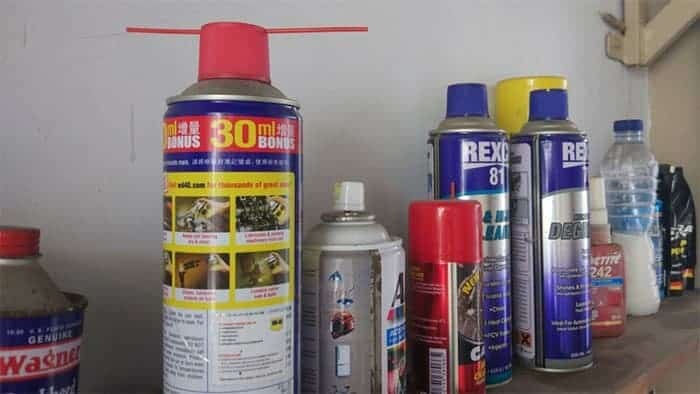 The aerosol product may be difficult to be sprayed out before the can is entirely empty. What Are the Functions of WD-40 Multi-Use Product with Smart Straw? Protects: The product has corrosion-resistant ingredients that shield against corrosive elements and moisture. You can use it on any metal surfaces for long lasting protection. Frees sticky mechanism: Use the product to loosen rust-to-metal bonds and free frozen, rusted or stuck metal parts. Removes: It can get under grime, grease and gunk. It dissolves adhesives allowing quick and easy removal of tape, labels, excess bonding material and stickers. Lubricates: The product’s lubricating components are widely dispersed, holding firmly to all the moving parts. Drives out moisture: It displaces moisture by drying out electrical systems and eliminates moisture-induced short circuits. What Surfaces Are Safe For Use With WD-40 Multi-Use Product? The product is safe on almost anything. You can use it on rubber, most plastics, wood or metal. However, avoid using on clear polystyrene plastic and polycarbonate. You can use it on your bike for preventing rust and mud from sticking or other sports equipment. The product should be handled with care. It may soften car polishes and other products on contact. This invasive nature means that you should take extra care around unsealed bearings and rubberized synthetics. 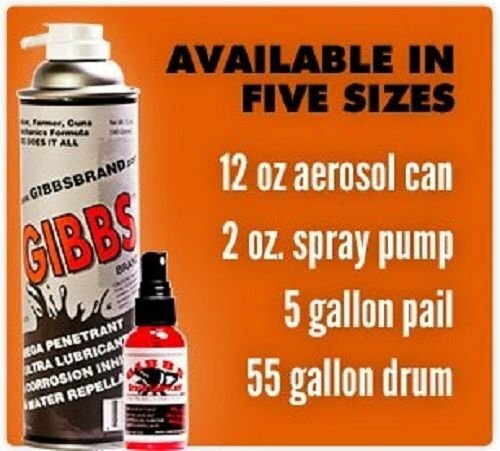 Gibbs brand is a lubricant with many uses both for domestic and industrial purposes. It is a revolutionary product that works in any temperature not only to eliminate corrosion, but also to clean, to waterproof and lubricate mechanical hardware. It is safe to use on rubber, wood, metal and plastic. It is highly acclaimed in the weapon industry as it is a complete gun care. Gibbs brand improves firearm action and preserves pieces regardless of it being in or out of use. The product is pricey. High pressure makes the product run over outside the can, making a general mess. What are the Major Uses of Gibbs Brand Lubricant? The product not only protects metals from oxidizing, but actually reverses effects of oxidation process when applied to rusty surfaces. 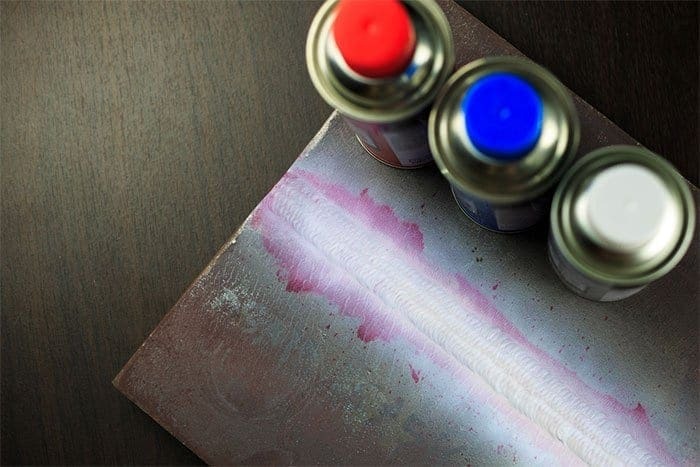 Spray Gibbs brand over rusted areas and then use a towel or paper to wipe gently into a uniform coat. I consider spraying a heavier coat on badly rusted surfaces and let it sit overnight. A couple of days should do before I completely wipe down the lubricant. If correctly applied on bare metal, a light coat of the product will minimize any possibility of oxidation. Over a given duration, the more times you apply it, the more effective Gibbs Brand will be. Put a number of drops of the product to the exact area where it is required. You will see that it begins to work immediately. In cases where parts or fasteners are completely frozen, apply the first drops followed by another couple of drops a day later. Other uses include protecting and cleaning brake parts and master cylinders, lubricating and waterproofing latches, hinges and locks and computer hard drive bearings. It may also be used for preventing electrical connections from oxidation, cleaning and protecting saw blades, a starter fluid for mowers, weed wackers, snow-blowers and so on. What is the best way to apply Gibbs brand lubricant? The product is easy to use. I normally start with a clean surface and spray a small amount of it in a few streaks across the area I am working on. Then, a clean towel should do to wipe the product across the entire surface. I then use another clean towel to wipe off any excess. When you are using Gibbs brand, remember to always wipe gently with light pressure leaving it where it is exactly needed. As the name implies, 3-In-One Multi-Purpose Oil can be used for various applications. This includes: loosening frozen parts, reducing friction and getting rid of rusty joints. You can also use it to grease, remove gum and to silent components that make squeaky noises. The product has the capacity of loosening parts that have been stuck together for a long time. It seeps into crevices and frees stuck parts in minutes. For cleaning functions, this oil is very useful as it removes grime and dirt effortlessly. The oil works as a lubricant and does not have any foul smell. It can be used at home on hinges, door locks, sliding doors, fans, sewing machines, window tracks, anything with wheels and so on. On automobiles, it can be used on windshield wipers, throttle cables, antennas, linkages, hinges, cleaning or rust prevention and anything requiring precision lubrication. In your garage you can use it for lubricating and protecting tools from rust, helping saw blades to cut better, keeping drills work smoothly and so on. In the office it can be used on swivel chairs, scissors, door hinges, file drawers and more. For sports and recreation consider using the product on boating hardware, skateboards and skates, on bike chains and tackle. When stored in an uncontrolled temperature surroundings, the bottle may warm up forcing oil out of the bottle as temperature goes up. This may eventually empty the entire bottle. How Can You Effectively Use 3-In-One Multi-Purpose Oil? The bottle is uniquely designed to give you absolute control during application to avoid spills. The squeeze bottle and drip application are part of the unique design of the bottle. It has a drip applicator with a cap attached. This ensures you apply the desired amount easily. The bottle has a fill level indicator strip to show you when you are running low. The product dries quickly leaving no messy residue and also minimize dust accumulation. Is 3-In-One Oil Suitable for Rowing Machine Chain? The 3-In-One Multi-Purpose Oil comes highly recommended for rowing machine chain. Just make sure you do not use too much of the oil. How is 3-In-One Oil Different from WD-40? The 3-In-One penetrating oil has two distinctive spout options that allows you to lubricate parts without splatter or over spray. On the other hand, WD-40 penetrates to loosen, degrease, and clean stuck parts, so as to prevent corrosion. The Kano Aerokroil is the aerosol form of Kroil which loosens frozen metal parts and threads just in minutes. A scientific principle decreases the surface tension for this solvent to creep into openings small as a millionth of an inch. The product also dissolves gum, oil, dried grease and frees frozen shafts and pulleys without attacking the metal. It displaces water, prevents rust and provides lubrication. Aerokroil creeps below the fouling in barrels, enabling you to knock it out easily with a brush. The product is a durable lubrication. It prevents further rusting by lubricating metal parts worked on. It works best for getting underneath and loosening carbon buildup, lead and copper fouling in firearms. The product is the best solution for lubing, cleaning, loosening exhaust bolts, rust removal, drain-and-fill plugs. To get the best results, I normally spray on required surface, leave it to penetrate for a while before wiping away. The penetrating oil is a bit expensive especially when you are operating on a limited budget. What is the mechanism behind Kano Aerokroil penetrating oil? Since not all frozen parts are a result of corrosion, molecular properties in the oil ensure that the final molecular architecture of the product is capable of loosening any frozen metal parts. This property enables Aerokroil to break bonds of rust and even loosen over torqued parts to free stuck metal joints. Kano Aerokroil is packed in an aerosol can for direct application. This makes it easy to access even the furthest parts. Any of the mechanical parts which are stuck together will be freed. This leaves no further reaction between the metal and solvent. The oil has a fairly distinct smell and evaporates quickly. You should be swift with your hands to minimize wastage. It should be used in open places and if this is not possible, ensure you open all windows to let air in. Can Aerokroil be used on a frozen water valve? Yes, it can be used. I recently used Aerokroil on a garden hoses. I sprayed them with enough Aerokroil and let them soak for 15 minutes. Thereafter, I was able to unscrew them easily. Liquid Wrench Penetrating Oil has been used for a very long time to loosen stuck components. It is among the most trusted oil as it is tough and excellent penetrant in the market. The oil is fast-acting to quickly dissolve rust and cuts through grease. It has high levels of solvency and lubricity and very low viscosity. The oil also has low surface tension. With such properties, it can flow into threads and very tiny spaces as well as cutting through tough rust. The products used in liquid wrench l106 penetrating oil are designed for common use temperatures even below 200 degrees Fahrenheit. The oil is yellow in color and is composed of hydrocarbon fluid, carbon dioxide, TMP Tri-oliate polyol Ester. It is safe on plastic, PVC, painted surfaces and metals. However, you should avoid spraying on wood, cloth and any other material prone to staining. It has a non-pleasant smell. Windows should be opened before you start spraying. What is the easiest way to use Liquid Wrench L106 Penetrating Oil? I start with brushing the surface I am working on with a wire brush to remove as much rust as possible. This makes it easier for the oil to penetrate all nooks and crannies. I then heat the surface with a lighter to expand metal and loosen more rust. I prefer spraying the oil generously on the surface to be worked on and allow it to soak for quite some time. For smaller spaces, I use a convenient applicator for a more precise spray to avoid spilling. After allowing it to sit for a while, I wipe the surface for a new shiny look. Will Liquid Wrench L106 oil harm the paint of my car? 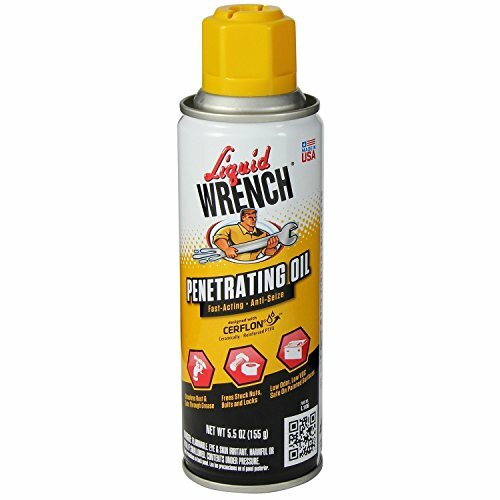 The Liquid Wrench penetrating oil will not damage standard OEM car paint finish. However, the oil could harm aged OEM paints or aftermarket paint finishes. LIQUID WRENCH is a local family owned company based out of Charlotte, NC. For more than 75 years, LIQUID WRENCH products, developed by the people who use them, has earned the trust of hard-working tradesment and the active DIYer through consistent, superior performance and a commitment to innovation. Frees stuck nuts, bolts, and locks. Powerful formula dissolves rust and cuts through grease. Low odor, 0% VOC, and safe on painted surfaces, plastic & PVC. 50-State compliant. Proudly Made 100% in the USA! Top Uses: Rusty nuts, bolts & hinges. Clamps & Pipe fittings. Locks & Latches. Frozen mechanisms. Nozzles and hose pipe fittings. The oil is a strong synthetic lubricant that is versatile and may be used for many purposes. It deeply penetrates, cleans and loosens stuck and rusted parts, providing a long lasting protection against further rust, wear and corrosion. Prevents binding and loosens stuck parts like nuts and bolts, hinges, and locks. Lubricating open gears, power tools, fishing tackle, lawn equipment, chains guns and rollers. It contains synerlec technology hence preserves parts in storage against corrosion and rust. It is used as a cutting fluid for facilitating ease of hand drilling, tapping and metal cutting of aluminum, steel and other metals. 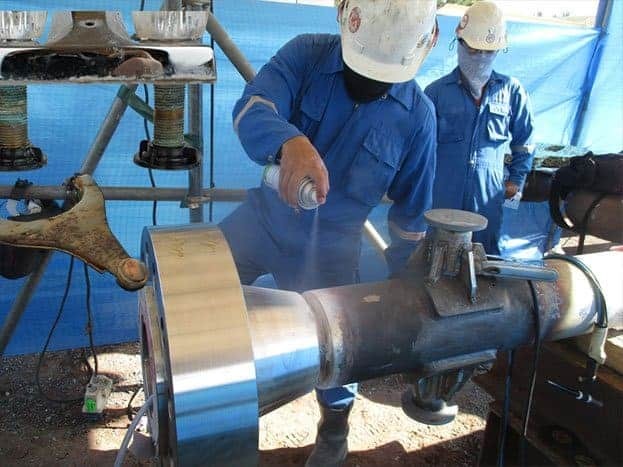 When the oil is applied, its solvent carrier evaporates leaving a tenacious, thixotropic film on metal surfaces, providing protection against rust, wear and corrosion. Maxfilm has a carbon dioxide propellant that is proven to make equipment run quitter and smoother. What is the best way to use Royal Purple Oil? On the working surface, be it hinges, nuts, bolts or other equipment, I make sure to brush it with a wire brush to reduce level of corrosion. This also increases the penetrating ability of the fluid. I then spray a thin film of the product and let it sit for a while. For the extremely damaged surfaces that have stayed for a long while in the garage, I spray another film after wiping the first layer. The resulting dry film will not collect dust or dirt. It also avoids gelling or gumming which may happen with other mineral-based products. Does the Royal Purple 05000 Penetrating Spray Contain Silicone? It does not contain silicone. According to the product’s label, it contains corrosion inhibitor, paraffin, Co2, and petroleum distillate. 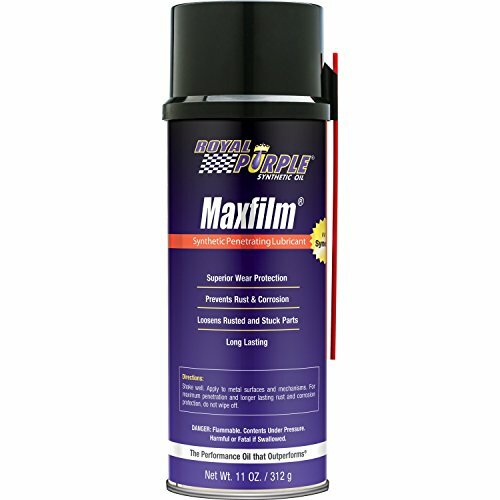 Royal Purple 05000 Maxfilm High Performance Multipurpose Synthetic Penetrating Spray Lubricant - 11 oz. Maxfilm is a high film strength, multipurpose, synthetic lubricant/penetrant that deeply penetrates, cleans and loosens rusted parts and provides long lasting protection against wear, rust and corrosion. It is ideal for loosening stuck parts such as nuts, bolts, hinges and locks; lubricating power tools, open gears, guns and rollers; preserving parts in storage and for use as a tapping fluid. It contains Synerlec technology. You should only spend more money if you are getting more value. With that said, I conducted a number of comparison tests to find out which one is the best penetrating oil for a given task. Here are the findings. Silikroil is an additional formulation of Kroil that provides some of the same benefits. Silikroil combines penetrating oil with dimethyl silicones. A Silikroil surface will repel moisture or water; thereby, avoiding corrosion. Kroil is a high performing penetrating oil. Its unique patented molecular architecture develops an attraction to metal that warranties swift penetration. It also maintains a molecular design that has the ability to break bonds, usually at the first molecular level. Generally, Silikroil is a formulation of Kroil. The only major difference is that the composition of Kroil does not include silicones. WD-40 is credited with numerous uses as a lubricant and a penetrating oil. However, is this really the case? 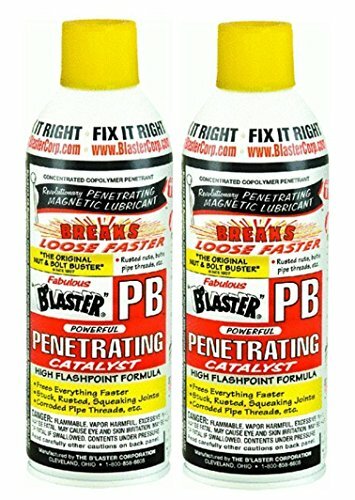 I conducted a comparison test between WD-40 and PB Blaster to determine which one is best. These two oils are things that you can get from local hardware store. To begin with, you all know the WD-40, which comes with a built-in straw. The PB Blaster; on the other hand, comes with a straw attached on the side. In the test, I aimed to do a detailed grease and penetrate. The first thing I did was a spray test on a vertical black board. I sprayed the WD-40 on one side and the PB Blaster on the other with the straw attached to each can. The WD-40 sprayed a light whitish fluid that is less viscous and flows quickly. On the other hand, the PB Blaster sprayed a thick whitish fluid with a high viscosity. As far as the spray test is concerned, the Blaster was way thicker than the WD-40. The next test I conducted was a penetrating test. To do this, I sprayed WD-40 on one side of my vise bolt and the PB Blaster on the other side. The WD-40 penetration was remarkable compared to the PB Blaster. Another penetration test involved a thirty pound weight to see how much of each oil could penetrate underneath the weight. I released a one second blast at the bottom of each weight. When I lifted the weights, WD-40 is the one which did a lot of penetration. The PB Blaster did very little penetration. It is clear from the above test that WD-40 is thinner than the PB Blaster. However, it is also clear that the WD-40 offers superior penetration than PB Blaster. This two oils work in almost similar manner. The only thing that makes the PB Blaster appear inferior when compared to Kroil is the odor. The Blaster has an odor that is relatively problematic to wash off. Kano Kroil is considerably less unforgiving. Unlike PB Blaster, Kroil has the ability to penetrate tight spaces, breaking rusting, compression, or tainting bonds. Its ability to reduce surface pressure allows it to creep in to places effectively. It also warranties no risk of rusting, thanks to its anti-water properties. I did also put the two oils to test to prove their effectiveness. For this particular test, I decided to use rusted nuts and bolts. I took two test pieces, labelled 1 and 2, and they both had the same level of rusting. I gushed Kano Kroil on the first piece and the PB Blaster on the second piece. I noticed that the Blaster oil was bubbling around the edges of the nut. I let the oils penetrate overnight. The two pieces looked like they had the same level of penetration on top of the bolts. The following morning, I used a breaker bar to undo the bolts on each piece. The one soaked with Kroil presented less resistance compared to the one soaked with PB Blaster. I noticed that the lubrication of the Kano Kroil was higher. On the other hand, the PB Blaster appeared less oil like and dryer. Both of the two are indeed universal lubricant and penetrating oils for almost anything. However when comparing Kano Kroil and WD-40 on rusted bolts and nuts, Kroil does a better job. Kano Kroil performs well in rusted machinery, breaking up rusted, frozen and joint nuts and bolts. Unlike WD-40, Kano Kroil has the ability to hit any corrosive impediment breaking it down, allowing it to act as a lubricant, releasing rusty nails, nuts, bolts and fast quickly and efficiently. Regardless of WD-40 taking a longer time than Kroil, it lubricates metal surfaces for longer lasting protection. To prove that Kano Kroil works better and efficiently, I did a nail climb test. I bought a can of WD-40 and Kano Kroil and used them on rusted nails. I set aside two nails with the same level of rusting. To determine the penetrating ability, the nails would help me evaluate how quickly the fluids will move up. After timing, I noticed that Kano Kroil travelled up the rusted nail 50% faster than WD-40. Therefore, penetration and climbing up ability of Kano Kroil is much higher than WD-40. To compare the PB Blaster and the Liquid Wrench, I decided to do a front and rear brake job. This job involved removing the calipers completely because I was going to paint them. I sprayed the PB Blaster on the driver’s side. On the passenger side I used the Liquid Wrench. The calipers soaked with PB Blaster broke faster compared to the ones soaked with Liquid Wrench. I usually use the WD-40 for milling aluminum, drilling, and cutting. I decided to test its performance in comparison with the Liquid Wrench. As far as the initial test is concerned, the Liquid Wrench seems like the real deal. However, it is darker in appearance and smells a bit different when compared to WD 40. As much as freeing rusted nuts and bolts is concerned, I chose to go with Liquid Wrench and not WD 40. This is so, since the Liquid Wrench presents superior penetration. Nonetheless, I would recommend the WD 40 for cutting fluid. Both penetrating oils are made as well as distributed by WD 40. Most of you would say that the two oils are exactly the same, but WD 40 is highly priced. I would not say for sure that they are completely similar, but the WD 40 performs better as far as loosening gum on parts is concerned. For a more effective comparison, I used both oils to clean an old steel bar. 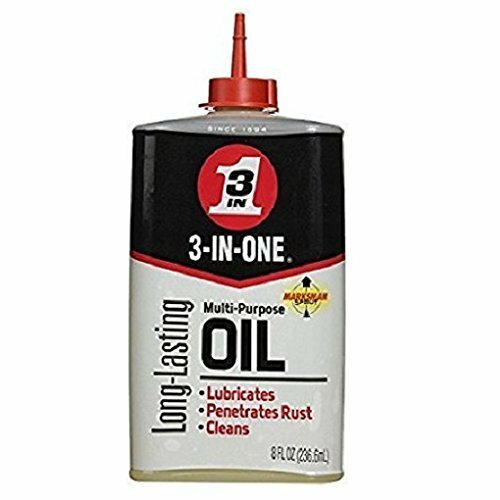 The best penetrating oil between the two as far as cleaning the bar is concerned was the 3 in 1. Based on the findings, I would recommend the 3 in 1 for lubricating, cleaning, and reducing friction. I would recommend the WD 40 for freeing sticky mechanism, loosening rusted parts, driving out moisture, and cleaning. These are the most frequently asked questions (FAQ) by people who intend to know more about specific Penetrating Oils for them to purchase the best penetrating oils on the market today. Most of the questions are answered in the article, but here is a highlight of a few questions and their answers. What is the Difference between a Lubricating and Penetrating oil? Penetrating oils are effective at freeing stuck locks, bolts, and nuts that normally contain corrosion and rust. On the other hand, lubricating oils are effective at protecting and preventing parts from getting stuck. A great number of penetrating oils have very low flash points that cause high flammability rating. One of the oils that is known to have a higher flash point and is practically non-flammable is Lawson non-flammable oil. This oil has quick penetration compared to the competition. Which Penetrating Oil is Suitable for Cleaning a Barrel? 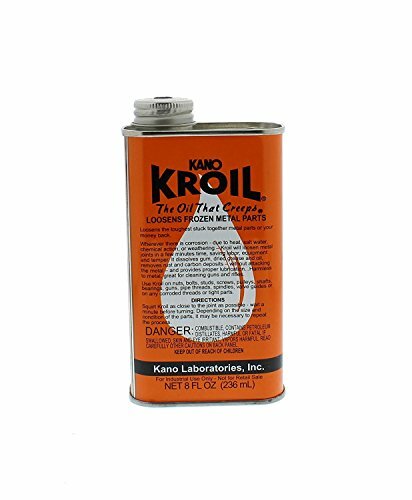 I choose Kano Kroil as the best penetrating oil for cleaning a barrel. The moment I have finished shooting, I wet the barrel with Kano Kroil and leave it for a few days. I let the barrel lie horizontally and turn the rifle over onto the other side twice a day. It has happened that after I had done this to a barrel and pushed a patch through a few days later, long threads of copper came out of the muzzle. Therefore, it is important to clean a barrel before shooting with it again. WD-40 refers to Water Displacement, 40th formula. WD-40 is the 40th attempt to make a Water Displacement chemical and is very useful for lots of jobs. This penetrating oil has five basic properties: penetrates, cleans, lubricates, displaces moisture, and protects. Will Liquid Wrench Penetrating Oil Prevent Rust? Yes, it will. The Liquid Wrench will prevent parts made of metal from rusting, thanks to its corrosion and rust inhibiting properties. What Are the Formulations of Kano Kroil? The Kano labs has two additional formulations of Kroil available that provide some of the same benefits. One is Silikroil, which combines dimethyl silicones and penetrating oil. The other is Penephite, a combination of penetrating oil and graphite. What is the Best Penetrating Oil for Seized Engine? WD-40 is one of the oldest remedies for lots of frozen parts, but there are other better solutions. Kano Kroil penetrating oil is about the best there is in the market. Usually, when I use Kano Kroil, it frees up my seized engine in a duration of 1 to 24 hours. Is Penetrating Oil Harmful to Plastic? In most situations, penetrating oils will not damage or harm plastic materials. However, there is a certain form of plastic that might get dissolved or damaged. The best thing to do is avoid the usage of penetrants on polyurethane. There are many penetrating oil brands in the market, and choosing the right model may be challenging for some people. However, this does not have to be a difficult proposition. I cannot say for sure which one will be the best penetrating oil for your application. This is so, since each and every one of these penetrants acts differently on different jobs. To help you choose the best product, I have selected and reviewed the best penetrants on today’s market. They are all high-performing choices, considering the quality and price. Personally, I would recommend the Kano Kroil for most applications. In a number of comparison performance test, Kroil prevailed against all others. But this should not limit your choices. Other tests I conducted revealed the highlights and drawbacks of the other reviewed penetrants. So, there is one that will definitely work for you. Is penetrating oil harmful for skin? Has anyone had any luck with any penetrating oil? have you tried rust patrol multi purpose? what are your thoughts on it? How is Free All not on this list? It works ten times better than Liquid Wrench and better than PB. The only penetrating oil that works as good as free all is Kroil. What is the best penetrating oil for plumbing and seized engine? Any thought on pipe break penetrating oil? Besides that how to loosen rusted galvanized pipe? Do you have any blog post on this topic? I am looking for the best penetrating oil for exhaust manifold bolts and aluminum? I have looked at many penetrating oils over the month. How to loosen a tight nut plumbing? What can you recommend? Thanks for the critical tips I’ve learned through the blog. Is WD 40 penetrating fluid? And will it unstick pistons? Thanks for the tips shared through your blog. What is the best penetrating oil to remove a oxygen sensor and stuck engine? From your list what is the best rust loosening product? I need honest suggestion. Thnx for a great list of best rust breaker. Any chance to remove exhaust manifold flange bolts with penetrating oil. If yes then suggest the best penetrating oil for exhaust manifold bolts that really works ? Thnx in advance. What is the difference between WD-40 and liquid wrench? Is Liquid Wrench the same as WD 40? 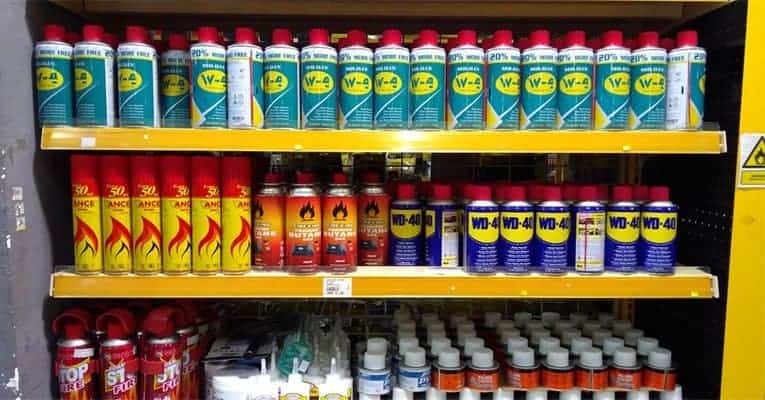 What can I use instead of WD 40? Many additive companies prey on the misconceptions of consumers when it comes to penetrating oil. I don’t know that I agree 100% with what the author said, but there are certainly grains of truth to it. I’d like to clean spark plug, what is the easiest way to remove a stubborn spark plug?